I worked for several blogs and websites. In most of them, we often felt the need to share hints and ideas about future posts, about what each of us stumbled upon while surfing. Unfortunately, there was not a great way to fulfill that need, and we often told each other via email, or emailed the admin who would in turn forward to all the writers. 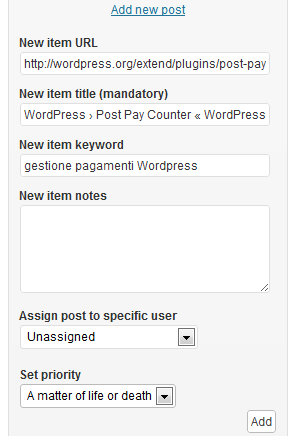 That is the reason why I wanted to build a WordPress tool that could simplify this sharing process. 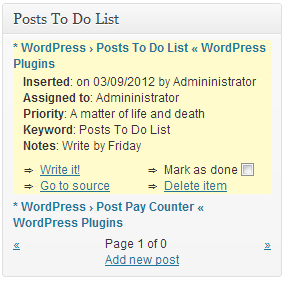 That WordPress tool is a plugin and is called Posts To Do List. 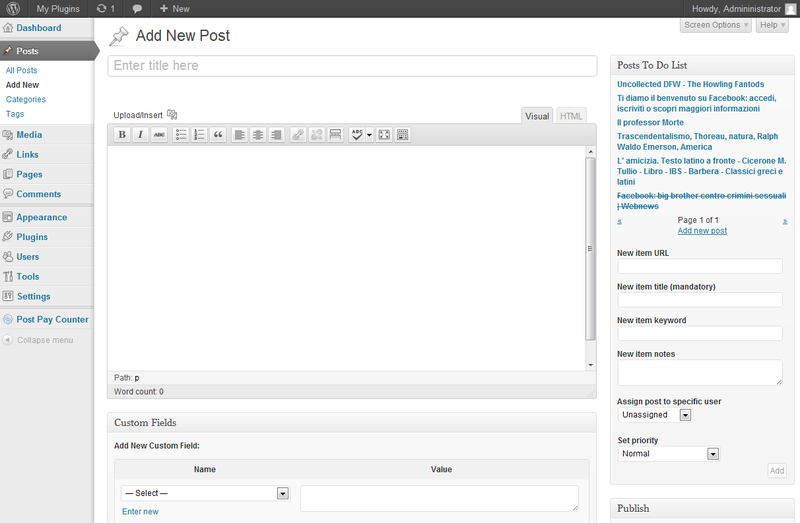 By a convenient box in the posts editing page, everyone will be able to share the posts they think are worth writing. You have this little box, where you put the URL of the page where you read that great post, and the plugin will fetch the title by itself. 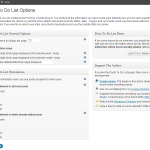 You will then be able to change the retrieved title, suggest a keyword and add other notes, set a priority and assign the post to some user of the blog. And if you want to leave everything blank but the title field, leaving a suggestion that anyone can catch and deepen… well, you can! You, as the administrator, want everything in the power of your hands? No problem, you can decide what user roles can add new posts to the to do list and what user roles can delete already added items. You want your users to stick to the post you assigned to them? You can hide the posts you have assigned to other users from their view. 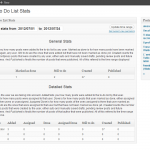 From a simple stats page it will be immediately clear how many posts you have already assigned and how many of them are still to do, so that it will be easy to understand how much your writers have done and how many posts you have still to assign. Almost every action is powered by AJAX, so that no page reloads are needed and you do not even notice it is happening, it just works. What do you want more? Cause we even have cookies! This entry was posted in IT, Wordpress and tagged php, wordpress by TheCrowned. Bookmark the permalink. Great plugin, however I have a problem with the email notice that is sent to users when a post is assigned to them. The date and who assigned the post is not correct. The date is displaying as: 1503462011 instead of 23/08/2017 or similar. Fantastic, thanks so much Stefano. Love the plugin. I run a multi-author football blog for news and opinion and this plugin could help organize things greatly. I second a previous feature request to allow all users to see the assigned author for each post idea. In many environments that can sustain multiple authors, ideas for a post can come quick to several people and lead to duplicate content. That wastes the author’s time, and quite frankly pisses them off. I do believe the plugin could be much more intuitive. The addition of seeing the assigned author’s name at the end of the title in the widget would be step one, absolutely. No need for special characters to denote assignment to yourself versus someone else. Fairly straight-forward process to bring in the author meta box. Step two should be an admin page to manage the ideas in as clear a manner as a custom post type can be managed; view, edit, delete. The third step most certainly has to be allowing for assignment revision. The whole idea of the plugin seems at least halfway centered around the notion of pitching post ideas that others may want to claim for their own. So assigning an author at creation without any ability to change that assignment in counter-productive. In that case, there are several good plugins that list drafts saved in the database in the same manner – that’s essentially what this does now, without creating the draft. All authors being able to see who is assigned to what post is part of that. The fourth step would then be to change the anchor currently linking to the source from the settings and post editor pages, and make it point to the admin management page from step two, specifically opening the post in question. From that page a source link can be used, as well as assignment, a link to create the post (like what’s in the email), and the keywords and notes in an editor. Anyway, this plugin is a fantastic start of what could be the best post idea creation and brainstorming plugin out there. I’ve tried them all as recently as this July so trust me when I say you’ve got a great foundation here. Hope to see some of these features, and no doubt an altered direction for the plugin, in the very near future. Thanks! glad the plugin suits your needs! Adding the assigned author in square brackets at the end of the title would be a nice addition, I had never thought of that, good! I plan to add the item editing feature as soon as I can. What do you mean with assignment revision? 1) In the “assign posts to a specific user” dropdown: it would be great to limit who appears in that box. We let audience members subscribe to the site, which makes it a challenge to find the names of our writers in the box. Even limiting it based on role (admin, editor, author, etc.) would be a big step forward. 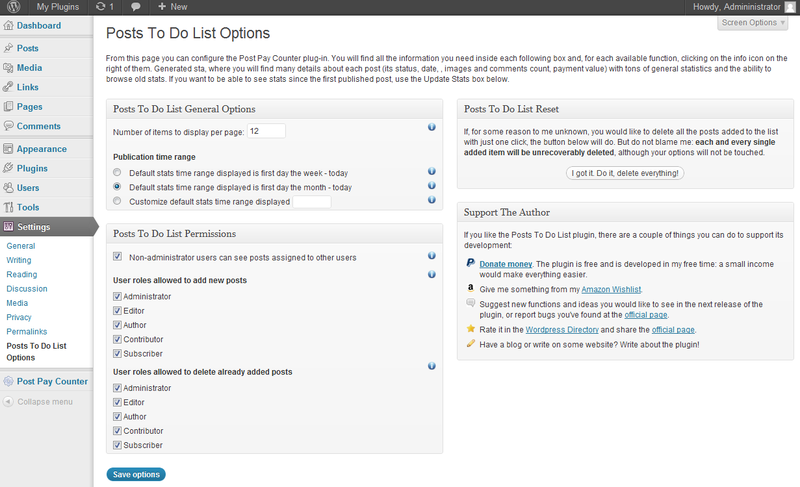 2) Letting someone edit items posted to the to do list, and the option of limiting it to just admins/editors. Sometimes a mistake is made, more information becomes available on a post, or we want to shuffle our priorities a bit. It would be nice to do that without recreating work that has already been done. 3) If an asterisk * appears next to a post assigned to me, I would also like to see a mark next to a post assigned to someone else, like a degree symbol ° angle bracket > or double-cross ‡ . It all helps to prevent someone from spending time on somebody else’s assignment. Greetings again Stefano. I’ve installed Post To Do List and my observation is similar to that for Pay Counter: it’d be good to be able to limit the number of users laded in the lists. It’s likely that only writers/authors/contributors will be getting assignments to write posts and not general subscribers so a long drop down with all users of a site could be tedious. A site with 300 subscribers means a long list to scroll to find the person getting the “to do”. Hi! It’s an interesting feature, I’ll keep it in mind for future releases. Just a FYI, Stefano: a guy named Pravin Paratey had created a To-Do plugin some time ago . 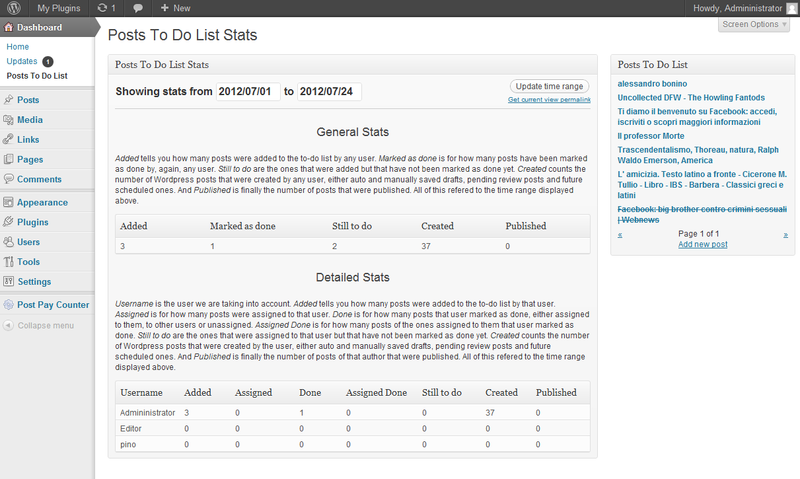 I wanted to use it to provide Authors on my site information on assignments and did some modifications. Pravin Paratey had added them to the official version (probably cleaned up my messy mods as I’m not a coder) in the WP repository. You can download a copy to look at from my side at http://www.lee-media-associates.cpm/downloads/todo-plugin.zip if you care. 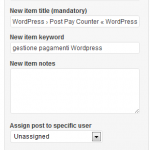 Thank you for this plugin, which is great for assigning posts to multiple authors in a WordPress blog. check that in the plugin settings page the your user role is among the checked ones in User roles allowed to add new posts. Does this work? Thank you Stefano for your help. 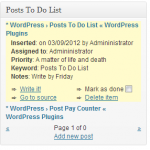 I am using WordPress 3.0.1 and BuddyPress : are you aware of a problem of compatibility with your Posts to do list plugin? No compatibility issues are known to me. Are you using some role managing plugin or the like? Try to enable the debugging mode in WordPress by changing define(‘WP_DEBUG’, true); to define(‘WP_DEBUG’, false); in your wp-config.php file and see if any helpful error appear. Hello, I’m interested in using your post, but I can’t figure out what a valid URL looks like for the form. In theory, my urls should look like http://gift-ideas.clubsandgifts.com/some-long-post-name-here but it doesn’t seem to accept any URLs I enter as valid. Can you help, please? Thanks! Hello, I do not understand why this would happen. If no URL is accepted (even URLs of websites other than the one you mentioned), then I guess there is some problem with your server configuration and outbound connections. If no URL works, you should check that. Thanks for the quick fix! Works great now. There was a problem with new installations: release 0.8.1 should have fixed that. If you still experience the problem, it should be enough to check a role for the authorized to unassign items ones, save Options, then uncheck it again (if you don’t want it) and save once more. Errors should be gone. I would greatly appreciate if you could help find a solution because this plugin could potentially resolve our team management problems. I should have solved the problem with release 0.8.1, is it working now? Yes that fixed the problem. And you for the bug reporting. Bye! Your plugin works very well and I believe it will help our team coordinate better. -User is emailed when you assign a post to them. 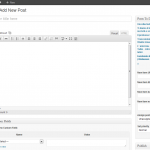 – You can edit a post item to change the title, url, keywords, notes, etc. Thank you for creating a great plugin. the first one can be easily done and I will look at it as soon as I have the time. As for the second features, it is quite a long and difficult task, and I do not think it will be added soon. I think that it takes so little time to delete an entry and add it again, thus correcting the mistakes, that it is not worth to add the editing capability. as of version 0.8.5, if enabled in the plugin options page, when a newly added post is assigned to a certain user, an email is automatically sent to them with the details of the new item. Hope it is what you were looking for.